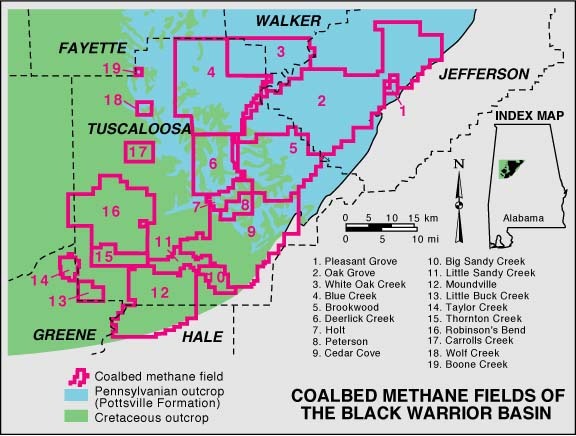 The first drilling for coalbed methane – aka natural gas – in Alabama occurred in the Black Warrior Basin in the 1970s. Initially, this practice served as a way to degasify coal seams prior to mining them, to attempt reducing the potential for explosions in mines. The gas was simply vented into the atmosphere. In the early 1980s, when it was realized natural gas has tremendous energy potential, drilling for commercial sales really took off. 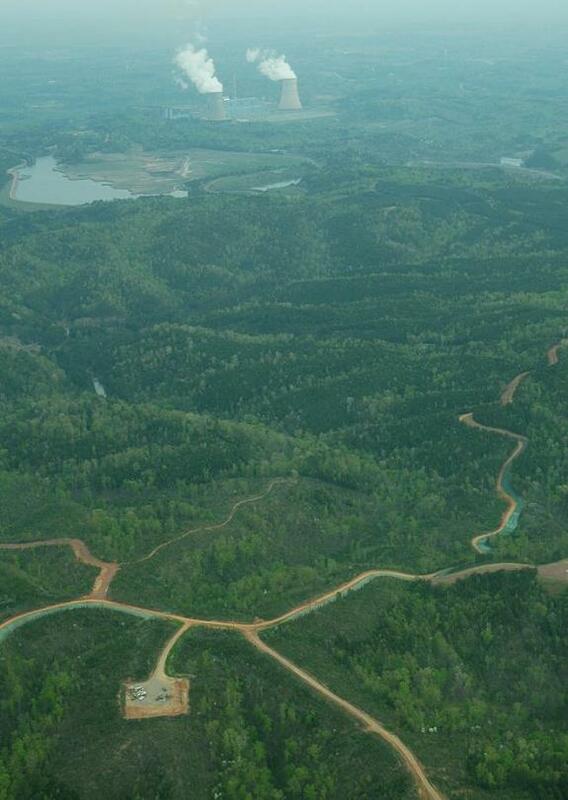 The Black Warrior Basin has the longest development history of any coalbed methane reserve in the United States. 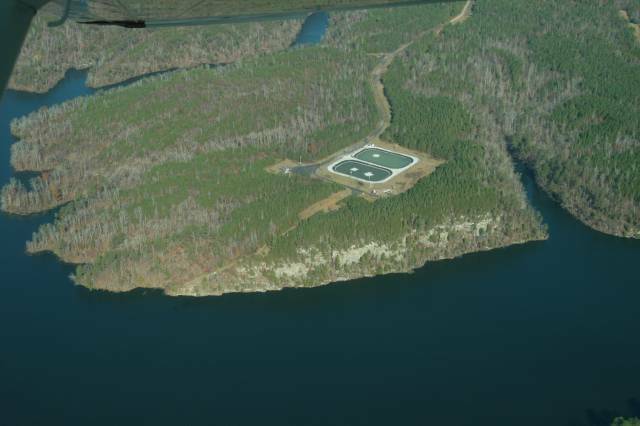 There were 5,537 coalbed methane (CBM) wells operating in the Black Warrior River watershed (as of April 2012). Tens of thousands of acres in the Black Warrior Basin are leased for drilling wells to access coal seams where the gas is trapped, creating a massive network of roads, well pads, and pipelines. Erosion from these areas is a documented source of sedimentation, choking streams and reservoirs throughout the basin. The extraction of coalbed methane involves a process known as hydraulic fracturing (aka “fracking”). Hydraulic fracturing forces a pressurized fluid mixture including water, acid, surfactant, gel, chemicals, and sand into the earth around coal seams, ranging anywhere from 350 – 2,500 feet deep. The fluids create underground fissures in targeted coal seams and surrounding rock and shale, and phenolic resin-coated sand holds the fissures open, allowing natural gas to flow toward the surface. In the Black Warrior Basin, coalbed methane drilling targets the Pennsylvanian Pottsville Formation, which is part of an unconfined aquifer, and the Cretaceous outcrop, which is associated with high groundwater salinity. Wastewater from the drilling process, called produced water, is commonly stored in open, lined pits. Some of this water is re-used. The state of Alabama allows CBM operators to discharge produced water to both area streams and the river as well as to wastewater treatment plants. Coalbed methane, or natural gas, is a fossil fuel which has significant full-cycle costs as a form of energy – from drilling using hydraulic fracturing, waste and wastewater disposal, methane leakage, pipeline transport, and consumption at power plants and homes. To see an Alabama Oil & Gas Board map of CBM operations’ footprint in the Warrior Coal Field, click here. Coalbed methane well and roads in the foreground. Miller Steam Plant in the background. (Jefferson Co., AL) Photo by Nelson Brooke. A Pot of Gold – or a Fracking Disaster Waiting to Happen? Could Shale Gas Power the World?